Phoenix Perry creates physical games and user experiences. Her work looks for opportunities to bring people together to raise awareness of our collective interconnectivity. A consummate advocate for women in game development, she founded Code Liberation Foundation. This organization teaches women to program games for free. Since starting in 2012, this project has reached over 2000 women in the New York area between the ages of 16 to 60. Fostering professional growth and mentoring new leaders in the field, she strives to infuse the industry with new voices. As principal founder in Dozen Eyes Games, a company producing works for social change and interactive installations, she also is an entrepreneur. Currently, she is a Lecturer in Physical Computing at Goldsmiths, University of London. 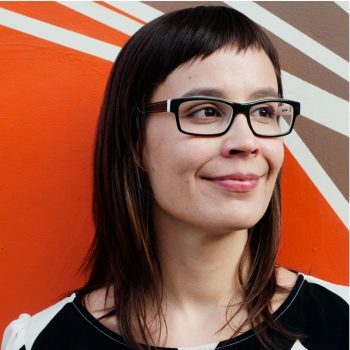 Her speaking engagements include A MAZE, GDC, Games for Change, The Open Hardware Summit, Indiecade, Comic Con, Internet Week, Create Tech, IBM Dev Pulse, Montreal International Games Summit and NYU Game Center among others. Perry’s creative work spans a large range of disciplines including drawing, generative art, video, games, interfaces and sound. Her projects have been seen worldwide at venues and festivals including the GDC, E3, Come out and Play, Maker Faire at the New York Hall of Science, Lincoln Center, Transmediale, Yerba Buena Center for the Arts, LAMCA, Harvest Works, Babycastles, European Media Arts Festival, GenArt, Seoul Film Festival and Harvestworks. In 2011 she co-authored the book, Meet the Kinect with Sean Kean and Johnathan Hall. Finally, she has curated since 1996 in a range of cultural venues, the most recent of which is her own gallery, Devotion Gallery until 2014. Devotion was a Williamsburg gallery focused on the intersection of art, science, new media, and design.